Tasmania's Largest Landscaped Native Garden! Share Margaret and Bill's excellent Tasmanian landscaped garden adventure in Margate, Tasmania. 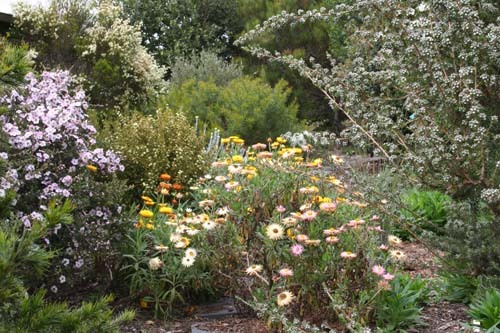 Find a wide variety of Australian plants growing in a landscaped setting just 15 minutes from Hobart. Events? Funny you should ask. Just scroll down this page. We've got a whole season's worth of events! Inverawe is a pioneering garden that sets the scene for Australian gardens of the future. With Australia's hot, dry climate, we can't continue gardening in the European style. We need to grow gardens that sit softly on our fragile landscape. That's Inverawe! Come and see! Enjoy strolling through 22 acres of colourful landscaped native gardens, take in the stunning views of North West Bay and listen to the birds. Inverawe is waterwise, sustainable gardening at its best. Inverawe Native Gardens is open seven days a week, 1 September till the end of May. First entry 9.00 am, last entry 5.00 pm - see you in the garden sometime! On arrival you receive a personal introduction to the garden and a colourful map to guide you. Interpretation signs set the garden in its historical and social context. Poetry, sculpture and whimsy add to your enjoyment. At the end of the visit we will be on hand to answer any questions. Take tea on the terrace and contemplate tranquility. Wheelchairs: 200 metres of pathway on the top terrace, including the tea terrace, is wheelchair accessible. Enjoy some of the best views in Margate. There is a turning bay at each end of the path! Inverawe is on the road to Bruny Island. Better still, subscribe to our free newsletter - just four editions a year! When you visit Tasmania, you'll want to see Tasmania's other great gardens - here's the Head Gardeners suggestions. We've got a flock of events lined up for the 2019-2020 season, all designed to help you create or enhance a beautiful, bird attracting garden that sits softly on our often fragile landscapes. We will be posting our event schedule pretty soon!